The city’s most talented youths and adults will showcase their abilities during Saturday’s seventh annual BC’s Got Talent. This year’s contest will feature 22 acts, with performers ranging in age from 6 to 66, said Justin Keogh, who serves as master of ceremonies. 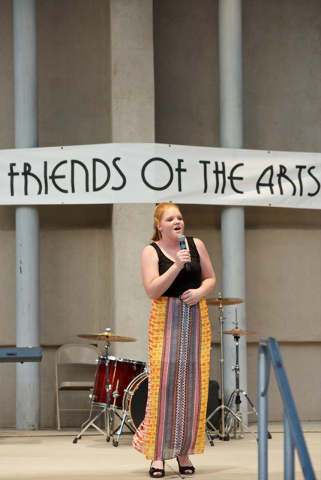 The free talent contest will begin at 7 p.m. at the amphitheater at Boulder City Library, 701 Adams Blvd. Cash awards will be presented to the top three finishers in each category, with competition divided by age. Cheryl Waites of the Boulder City History and Arts Foundation, which is presenting the talent showcase, said the show is a good representation of the heart of the community and how people support its various events and activities. She said people are “overly eager” to volunteer and “everyone is ready to say yes” in helping put on the show. This is the first year the foundation will present BC’s Got Talent. The organization formed last year when the Friends of the Arts, which originated the show, merged with the Historic Boulder City Foundation. Tina Barber of Boulder Dam Credit Union, which helps sponsor the event, said participating in BC’s Got Talent is a way for the financial institution to continue its support of the community. “The credit union has always been active in supporting kids. This is a great opportunity to contribute to a wide variety of ages,” she said. Barber will be joined by her co-worker Tina Finn as a judge. Also judging will be Susan Melton of sponsor Sempra U.S. Gas and Power/Copper Mountain Solar. Personally, she said it feels wonderful to work for a company that is so supportive of the community where she lives. Additionally, the show will include guest performances by Lucas Tolman, who won the 10 and younger division, and twins Kannon and Kenny Rose, and Aimee Finn, who tied for first place in the 11-18 age division. Todd Wolter and Ashley Dewolf, who won the adult division, are expected to open the festivities with an a cappella version of “The Star-Spangled Banner,” as well as performing while the judges are tabulating their votes. Lanette Coker, music teacher at King Elementary School, will provide piano accompaniment throughout the evening. Various refreshments will be provided, some at no cost and others for a slight cost, with proceeds benefiting the foundation. Keogh said volunteers are needed to assist with various tasks throughout the day. Those interested can call him at 702-480-3615. For more information, visit www.bcsgottalent.com.